Meet Calpurnia Peach. She’s the lovely, mischievous, free spirited young lady whose Minnesota adventures shape her youthful style! Actually, meet the two ladies who make up this upstart clothing line right here in Minneapolis. Fresh off their Voltage Amplified success, they’re ready to wow Walker patrons with their unique designs and original prints for this Thursday’s art lab. 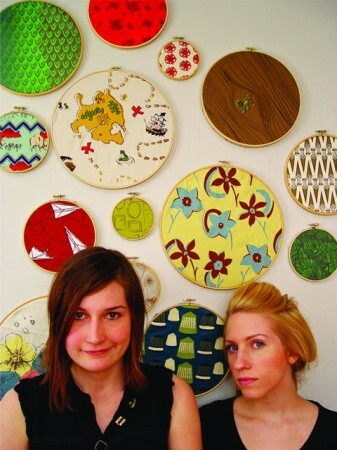 Luci Kandler and Ashley Wokasch will demonstrate the screen printing process on some of your old clothes. Public Programs intern Jamie Sandhurst talked to the dynamic duo about their process and Ms. Calpurnia Peach herself. How and when did Calpurnia Peach get started? Where did the name come from? Calpurnia Peach started when we were studying in New York and were thinking of applying to Voltage: Fashion Amplified 2008 in Minneapolis. We deliberated on the name quite a bit. Ashley liked Calpurnia because it was a childhood nickname of hers and peaches were a current infatuation of Luci, and bam! The two just worked together so well that we decided to not only use them but to create this little girl character with that name, to represent the brand. What kind of imagery do you use on your clothing and accessories? We mean to inspire adventure and youthfulness in our prints. They have ranged from New Zealand flowers, to daggers, to paper airplanes, to ceramic 1950’s quails. We have such a broad range of inspirations but we keep the prints wearable. How was your experience at Voltage: Fashion Amplified? Voltage is such a life-saver to Minneapolis fashion. We learned so much from our first experience with the show and it opened us up to the twin cities fashion scene so quickly and completely that we were able to move forward at a fast pace. Our second year with Voltage showed evidence that local fashion is improving just as quickly with some really great talents and an awesome support system. What can we expect in the future for Calpurnia Peach? We’ve talked about a variety of ways to extend Calpurnia Peach, but our main goal right now is increase production while maintaining the quality and keepsake feel of the line. And lastly, what can we expect for the upcoming Art Labs on June 11th and 25th? It’s going to be a blast! Expect to learn the screen-printing basics quickly and then put them to use on any fabric surface you would like embellished, think outside the box! Here’s a few tips when picking your surface, pick something that’s smooth and doesn’t have a pile, the lighter in color the better but we can do dark fabrics too, choose something that can lie completely flat so that you get a smooth print.